On September 25, the public organization "Zhyegu" (Hearth) has addressed the Chair of the Krasnodar Territorial Court. The authors of the appeal note that they are "outraged by Ruslan Gvashev's prosecution and categorically disagree with the court's judgement." 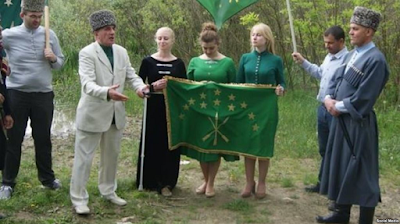 The "Caucasian Knot" has reported that starting September 11, Ruslan Gvashev, 67, a former chairman of the Council of Elders of Circassians-Shapsugs, is holding an unlimited hunger strike in protest of the judgement to fine him for a prayer he administered at the Tulip Tree. "Under the longstanding tradition, on May 21, Circassians-Shapsugs of the Krasnodar Territory and various Russian cities gather near the Tulip Tree in the dwelling settlement of Golovinka, where together, without any prior warning, with the whole Circassian world commemorate victims of the Caucasian War," says the appeal posted on the website of the Kabardino-Balkarian Human Rights Centre. The appeal emphasizes that during the prayer Ruslan Gvashev "was given the floor to speak in his native language about the need to commemorate our ancestors." "Gvashev's actions were quite legitimate," the Circassian activists have stated. Ruslan Gvashev treats his condition as satisfactory, Ruslan Gvashev reports health deterioration, Ruslan Gvashev goes on hunger strike.